Not only does Natura Made Prenatal + DHA have the nutritional support for pregnant and nursing moms, it is also optimal for women trying to get pregnant with 23 key vitamins, minerals, and essential Omega-3 Fatty Acids. Omega-3 Fatty Acids may benefit the neurological development of the fetus and the health of the mother during pregnancy. **This statement has not been evaluated by the Food and Drug Administration. This product is not intended to diagnose, treat, cure or prevent any disease. Talk to your doctor to see if the Nature Made Prenatal + DHA vitamin is right for you. Retails for $18.49 for 90 vitamins, which works out to just to around $6 each month. Even better, Costco shoppers who become members of the Nature Made Wellness Advisor have the benefits of Wellness Rewards points toward a $5 or $7 Costco Rebate code found on the package to start earning points. Sign up at NatureMade and enter Costco as your preferred retailer. 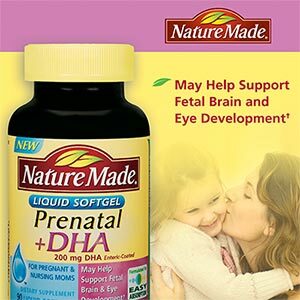 NatureMade is offering one lucky Bargain Briana reader a 9 month supply of Nature Made Prenatal + DHA vitamins. 1. Leave a comment and let me know if you are pregnant, nursing, or know someone who is pregnant or nursing! 2. Become a Facebook Liker of Bargain Briana on Facebook. 4. Subscribe to my free newsletter via email or RSS. You must confirm your email subscription for it to be a valid entry. If you are already a subscriber, leave a comment letting me know you are already subscribed. Please leave a comment for each additional entry. Giveaway ends 10/19/2010 at 11:59 p.m. EST. Winner will be chosen by random. Be sure bargainbriana@gmail.com is in your safe sender list as you don’t want to miss the email if you are the chosen winner. If winner doesn’t respond to my email within 48 hours, I will pick another winner. U.S. Entries only. This giveaway was sponsored by Nature Made. Post was written 100% by me and was not edited by the sponsor. Read more on my Disclosure Policy. Want to win more? Enter to win the rest of my current giveaways! My friend is pregnant and would love this! I am preggers and these would be awesome! I now like you on Facebook! I suppose I’m in the same boat as all the others. My husband and I are trying to have our first one but have been unsuccessful so far in the journey. It’d be a great encouragement to get some vitamins that might (even if it’s just a little) help us! and I subscribe via RSS. I also “like” you on facebook. I am pregnant with #3 and would love free prenatals! I “like” Bargain Briana on Facebook! I’m trying to get pregnant with kiddo #2, so a 9-month supply of prenatal vitamins would be great! I’m also a subscriber to your RSS feed. I’m nursing. What a timely give away! I have been pregnant and nursing for 6 years now:) This would be perfect b/c I only have one prenatal left. Preggo with #3 – winning would be a blessing! I am currently undergoing fertility treatments trying to conceive a second child. My doctor has me on prenatals in the meantime, so this would be awesome! I have a good friend who is pregnant! I’m a subscriber – thanks for entering me in the contest! My sister is pregnant…I know she’d be interested in this! Hoping to be pregnant soon! I am currently 12 weeks pregnant and would love to win this. We just started trying to get pregnant 3 weeks ago!! I also have a friend who just found out that she is pregnant 2 days ago! Hoping to have #2 soon! Trying right now, so soon! I also get the daily emails. I am getting pregnant with number three at the end of the month!! I need these!! We’ve been trying to get pregnant with our first! I’m nursing and I would love to win. And I subscribe via google reader. I am a liker on facebook. Great giveaway! My husband and I are getting ready to start trying for our first, so this is perfect timing. My son is 6 weeks old and I’m nursing. Currently I’m taking 3 vitamins to get what I need to nurse. To win these and take only one pill would be GREAT!!! Fingers crossed! I know someone who is trying to get pregnant! I have just confirmed my email subscription! I now “Like” Bargain Briana on Facebook! We are trying to get pregnant right now so the prenatals would be awesome! I am a fan on facebook! I am TTC #3. I would love to win these! I subscribe to your email newsletter. We have been trying to get pregnant with #3 so that would be awesome to win! I am currently losing weight from my last pregnancy and hoping to start trying to get pregnant again in the next 3 months. This would be wonderful! We are trying to get preggo with baby #3. Would love to have these to try out. I have a hard time taking vitamins without gagging so I would love to try these out. I “liked” you on Facebook. Have you on my google reader! I’m nursing and have been awful about taking my vitamins! this would definitely get me back going again!! I signed up for your emails! Thanks! I am trying to get prego with #2. These would be awesome to have! Disclaimer: This post may contain a link to an affiliate. See my disclosure policy more information.